On the evening of the 20th anniversary of the line of duty death of Kenneth Hendrick, the members of the Morningside Volunteer Fire Department held a memorial service. The event was attended by nearly 100 members of the Hedrick family, friends and firefighters. Two volunteer members, currently serving our Country in Afghanistan, attended by way of Skype and interacted with many friends while on line. On January 12th 1992, Engine Company 27 was dispatched for a first due house fire at 3807 Walls Lane in Suitland. Kenny had been in the structure and made a rescue of the family's seven year old son. Kenny reentered the house to search for additional victims. While searching the basement, he became trapped under debris and perished. Kenny had been a member of the department for about two years. Les Hedrick, his father, was Fire Chief at the time but was not on the call. Kenny attended LaPlata High School and had his sights set on becoming a career firefighter in the Washington DC area. 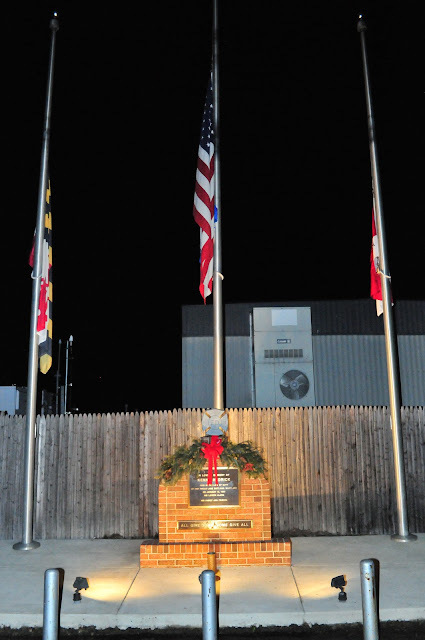 Kenny's uncle, Ford Gallagher, at the time was a 12 year veteran of the Prince George's County Fire Department (PGFD). At Kenny's funeral, PGFD Fire Chief Steve Edwards made Kenny a honorary career firefighter in the PGFD. The new Rescue Squad 27 is dedicated to Kenny. Kenny's parents are still active in the department today; Les serves on the Board of Directors as well as being Vice President and his mother Cathy is still active in the Ladies Auxiliary. Both Les and Cathy are active members in the Fallen Firefighters Foundation and are counselors for families of other fallen firefighters across the Nation. Kenny will be missed by his family both in and out of the fire station. His love and devotion to the fire service will live on as an inspiration to all. 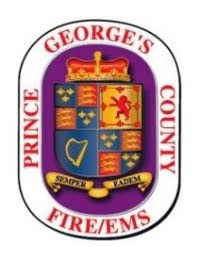 The solemn ceremony opened with prayer of scripture readings by Prince George's County Volunteer Fire/Rescue Association Chaplain Harry Hetz. Prince George's County Fire/EMS Chief Marc Bashoor. Bashoor stated, "Kenny never intended to die. No firefighter does. Like all his brethren in our calling and service, Kenny accepted the daily prospect that he may be called upon to make that sacrifice. He accepted the daily prospect of that potential sacrifice with a full cognizance and awareness of the risks and dangers of the environment we operate in. That is why courage and bravery is not measured solely in the sacrifice that is represented in death: those core virtues are measured in performing the job with the knowledge of the constant danger of death, and yet doing it with all the power within your soul in an manner that seeks to minimize that danger not only for yourself, but for all of those who operate around you." Kenny's parents, Les and Cathy, attended and participated in the event. Chief Bashoor addressed them by saying, "Yet too often, once the echo of the bagpipes wither away and the units in the funeral procession one by one return to service, we fail to recognize that a family continues to grieve and is too often left unaided to find their way and process their great loss. That is why I am proud to say that from just days after our Department mourned and buried Kenny, one of my greatest heroes…a true “Profile in Courage” in my own life - has been – and remains to be - Kenny’s mom…Cathy Hedrick. Cathy lives each and every day in a world of caring and compassion for the tragic loss of others, and through her work, a little bit of Kenny lives on too. She has the deepest personal knowledge of the scars that such a terrible loss can bring to a family, yet through that tragedy, she has developed and fostered a God-given gift of comfort, compassion and grace that transcends normal human experience. Cathy, you give so much to others, and it is evident to all who know and meet you that this spirit and motivation exists deep within you. As a loving son, let me publicly proclaim to you on this sad anniversary the words we all know to be true…Kenny is proud of you. I am proud of you. We all are. Cathy, you are truly the “better angel” that all of us strive to one day become." Cathy and Les together spoke at the podium and thanked everyone for attending. Cathy stated, "the last twenty years would not have been possible without the support of the fire service family." An underlying theme throughout the service was the role of the National Fallen Firefighters Foundation (NFFF) where Cathy and Les first participated in the Survivors Program and are now permanent fixtures. The event concluded outside at the Memorial Monument dedicated to Kennth Hedrick with bagpipes and prayers. Congratulations to Volunteer Chief Michael J. White Sr., President David Hansen and the membership of the Morningside Volunteer Fire Department for a "Job Well Done" on the planning and coordination of this special ceremony.